The 15 Minute Forum tonight was led by science teacher, Jody Chan. The idea of ‘Walking Talking Exams’ (WTE) came from a PiXL meeting, attended by my Deputy Head colleague, Jane Squires. Their approach to it is described in this article from The Guardian, and a quick search on Google revealed that you can even find videos of ‘Walking Talking Exams’ in action, such as this maths one. I wouldn’t suggest you watch the whole thing – but it gives you a flavour of the process. Jody has adapted the process for her classroom. She felt that whilst her students had good scientific knowledge, they were losing too many marks, due to poor exam technique. So she saw this strategy as a good way of supporting students to develop this. In the past, like most teachers, when it came to practice exams, Jody set them the exam, the students did it and then it was marked…and returned. This didn’t really help them with understanding what the exam paper really wanted from them. So she took the idea of the WTE, but rather than doing it in the hall, with a large cohort, she did it in her classroom. 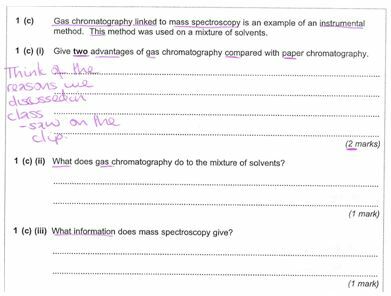 Made sure that she was clear about areas/ questions that students usually struggled with and why – this requires a good understanding of the specification, exam papers and mark schemes. Underlined key words in each question. Annotated the questions with key points to consider. Once underlined and annotated, the paper was then scanned, so it could be shown to students. Jody then went through the paper with the students, one question at a time, displaying her scanned copy of the paper on the projector and pointing out to them the points that she had identified as outlined above. It’s really important at this stage to make sure that you don’t give them the answer – in whole or in part. The purpose is simply to give them prompts and tips about how to answer the question. Once she had done this for each question, she then used a stopwatch to give them the right time to answer the question – 1 minute for each mark allocated. Students had a copy of the exam paper to complete. As you can see, key words have been underlined as well as the fact that there is a lid – this is key to the question. With this question, students are also encouraged to take a good look at the diagram first and assimilate all of the information in it first, before going on to the question – as they often don’t. Students need to understand that the diagram is there for a reason – to help them answer the question. 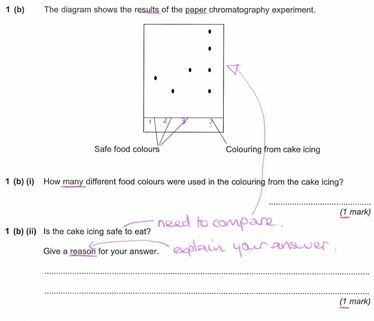 It was also stressed that they are only 1 mark questions – so just a simple explanation is required. In this question, it was stressed that students had to use the information from the diagram, in order to answer the last part of the question – and that they had to give a reason why. This seems obvious, but they often miss it. Again, here key words have been stressed and underlined – but there is also a hint to help them recall the knowledge they need, to answer the question, asking them to think back to the video clip they saw on gas chromatography. This is an important style of question to focus on. In the same way that diagrams provide students with information to use in their answer, so does a piece of text like this. Firstly though, students need to get used to reading through it and picking out the key words – so this was done together. This stresses the importance of them underlining key points in an exam question – as this helps them to focus on the key aspects of it. They were reminded that part (a) required them to explain why – giving a reason and that part (b) just required one risk. 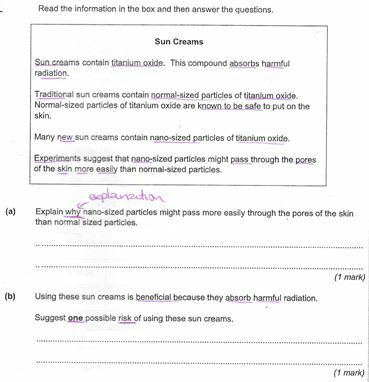 With question students are reminded that is a 2 mark question, so two causes are required. Focus should be placed on 2 mark questions, as student frequently miss out on the second mark because they simply forget about putting the all important second point. You will also notice here that Jody has reminded them what is meant by ‘experimental error’. In longer response questions like this 6 marker, students were reminded of how to structure their response i.e. step by step and in a logical order. After each whole question i.e. 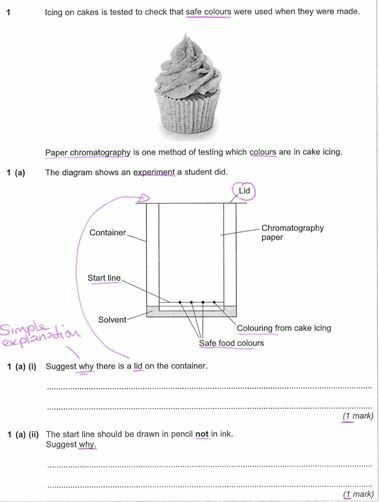 all of the sub questions in, for example, question 1, students were then talked through the mark scheme and marked their work. This gave them immediate feedback about how they had performed, that they could then respond to. Where they missed marks, they had to write out why they had missed the mark and what the correct answer was. It’s time consuming – if it’s a 1 hour paper, don’t expect to complete it in an hour. The class that Jody trialled this on performed really well – everybody got A*/A. This was better than they had performed before. As they weren’t given any knowledge during the process, this confirms that students lose too many marks needlessly, because they don’t fully understand the question, or use the information given to them. It’s probably worth doing this as preparation for another mock exam, that is just sat under normal conditions. You need to carefully pick out the points that you want to stress them. If you don’t, because of the nature of the process, they will think that it’s not important. It doesn’t have to be done with a whole paper. It would work just as well with just one or two questions during a lesson. Avoid using it too frequently – to avoid dependency. This entry was posted in 15 Minute Forums and tagged Revision. Bookmark the permalink. Excellent work jody, really practical strategy that will make a difference. I love this (and pretty much everything else that is posted on this blog). Will be using this in the Spring, a little late for trial exams that start this week.